Do you want to be pampered like royalty in the comfort of your home? Save yourself from those long traffic jams and waiting by making an online booking for doorstep beauty care services for everything from haircut services to pedicure services at Housejoy. Just login to their website or download their mobile app. Both are easy to use and you'll have a pampering session booked in just a few minutes. You can sit back and relax on your couch with a magazine while the beauticians pamper you from head to toe. Apart from individual services, Housejoy also offers a number of grooming and pampering packages such as Monthly Essential Package, Monthly Grooming Package, Tip to Toe Package, Skin Radiance Package and Summer Skin Package. You can book beauty sessions on a regular basis and say goodbye to waiting at a salon and spa for your turn. Do you have a wedding coming up and want to save yourself from the sun and pollution by making a booking for a beautician at home? Head to Housejoy.in and choose from a variety of doorstep beauty care services to get pampered and polished from head to toe without leaving the house. You can choose from a variety of effecting skin care services such as body polishing, bleaching, facials and more. The skin care experts at Housejoy are trained and experienced in providing the best in beauty care. Mehendi is such an important part of beautiful Indian weddings. But finding a reliable and experienced mehendi artist isn’t easy. You don’t have to call friends or ask Google to find a “mehendi designer near me” because Housejoy takes care of that too. You can hire a professional to apply mehendi to you, your family and even your wedding guests. And if you’re looking for some pampering for your tresses, you don’t have to look for random hairdressers around town. Housejoy is India’s first personalised services provider and has a solution for all your needs. You can select services for hair dye, hair care, hair extensions and more. Make a booking for a variety of hair treatments with the click of a button. The beauty service provider has options for L’Oréal and Matrix hair spa treatments, hair smoothening treatments and hair straightening treatments. The hairdressers and beauticians at Housejoy are well-trained and have a minimum of 3 years of experience. So make a booking online and enjoy salon services at home. Did you know you can even turn to Housejoy for your home needs. 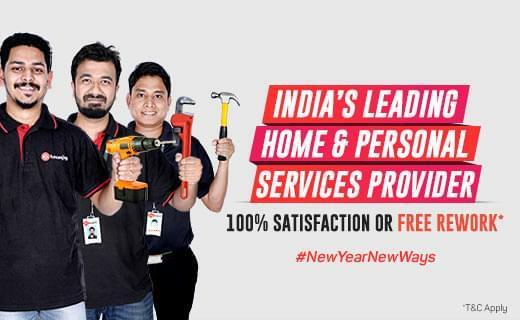 They offer puja/pandit services, premium house painting services, appliance repair services, plumbing services, carpentry services and deep home cleaning services. Why deal with a dozen service providers when you can have all your problems solved by one? Housejoy offers quality services thanks to their team of experts, and provide free rework in case you’re not satisfied. If you download the app you can make multiple bookings on the go easily. And if you book multiple services, Housejoy Assist will appoint a dedicated relationship manager to take care of your portfolio of tasks. This means you can relax and let the experts take care of your work for you. Have you ever needed to wax but don’t want to step out looking like a mess. Why not make a booking for beauty services at home? Save your valuable time and energy by avoiding that trip to the salon and make a booking for spa and salon services at Housejoy. You can book waxing services, bleaching, facial hair removal, bleaching and more with a few clicks. Choose from regular waxing and Detan Liposoluble waxing. Detan Liposoluble waxing is a service where beauticians use a wax that is best for your skin type. This is especially useful for those who have sensitive skin and cannot use regular wax. In Detan Liposoluble waxing, the beauticians also use a pre-wax oil and a post-wax gel that helps soothe the skin.The beauticians and massage therapists from Housejoy are courteous, trained and certified professionals. They know how to care and treat different types of skin and hair. So don’t look for salons near you, just make a booking online. Use the time and energy you save for better things like binging on your favorite Netflix series or Skyping with your best friend. Are you looking for “beauty services near me” on Google? Don’t waste time calculating routes and reading reviews from strangers. Just visit Housejoy.in and make a booking with expert beauticians within a few minutes. You can choose from hair extensions, facials and other skin treatments. You don’t have to worry about waiting and lines or delays because the experts at Housejoy are on time. They come equipped with top-notch products from brands such as L’Oréal, Cheryl and Matrix. And they also carry the necessary tools and supplies that they need to provide the skin and hair care services. They even use disposable kits to offer the ensure absolute hygiene. Enjoy beauty services at home by making an online booking at Housejoy today. Is your 9 to 6 job robbing your skin of its glow, making it look dull and stressed? Do you want to rejuvenate yourself but don’t have the time to visit the salon because of work? Don’t spend valuable time on the internet in search of facials near you or facial spa near you. Save your skin with at-home beauty care services by Housejoy. You can opt from a range of facial cleanser services, bleaching and skin treatments. The beauty care experts at Housejoy are well in pampering skin with a variety of facials. You can avail facials that help with tan removal and add a glow. Or opt for treatments that use leading brands such as Cheryl, O3+, Christine and SeaSoul. You can also make a booking for an effective under-eye treatment, skin lightening treatment or face whitening treatment. And if you’re looking for some fancy pampering, you can choose to get a gold or diamond facial done. If you want to avail grooming services to remove pesky facial hair, you can choose from face hair removal by wax or threading, bleaching and more. Make a booking to avail doorstep beauty services. And if you realise later that you want other services, you can have them added to the list. Have you been overworking yourself and feeling the aches down to your bones? You should take a break and get a massage to help your body relax. If you’re too tired to head to the spa, you can get the spa to come to your doorstep. Thanks to Housejoy because they provide at-home massage services. Choose from a relaxing foot massage, destressing back and shoulder massage, soothing head massage and a one-hour full body massage. Let the experts at Housejoy help you relax and say goodbye to all those aches and pains. Online bookings at Housejoy for various services make life so much easier. Housejoy caters to more than just at-home beauty care services and body massage services. You can get your house pampered too. Choose from deep kitchen cleaning services, deep bathroom cleaning services, carpet shampooing, painting services and more. The cleaning crew will help your home look and feel new. Housejoy is your one-stop solution for all your home and personal needs so download their app and make a booking for the services you’re looking for.